Firstly let’s talk about RSS. 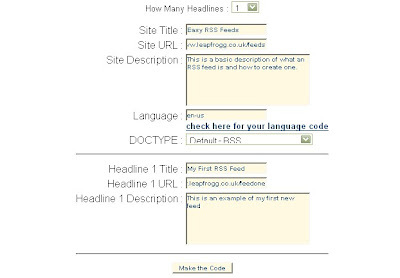 RSS stands for Really Simple Syndication and it is a way of automatically putting your content in front of people in places other than your own website. Here is what RAW RSS looks like: Pretty eh? How can people read this RSS feed, it looks like Gobbledegook? Good, question, they read it via a piece of software called a feed reader, and this application takes all the RSS content and organises it neatly into one single location for easy viewing. There are a number of these readers out there to use, Google Reader being possibly one of the best known, but other such as Bloglines, Feed demon and Newsgator are also widely used. Ok, but if I wanted to make an RSS feed, how would I do it as I’m not a techie? Firstly select how many headlines you want to be included in your feed. I have selected 1 for the example. Then think of a snappy and descriptive title for your feed, Since mine is about RSS feeds made easy, i have called it “Easy RSS feeds”. Then I’ve added the URL of where these articles will appear and then a breif description about what the feed will contain. Language should be set to English but if it is not, click on check here for your language code, then choose the Document Type which is RSS. I have then added a headline, in this case it is about “My first RSS feed” and again I’ve included a URL specific to this particular article and a quick description about it saying “This is an example of my first new feed” and that is it, Simple eh? This handy tool then converts these selections into code, as shown below. 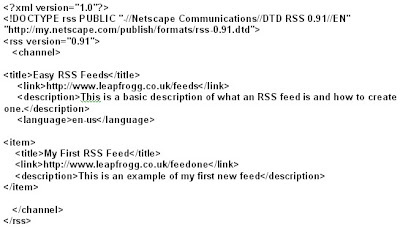 As you can see the tool fills in all the elements needed to create an RSS feed? Ok so I have got this Feed thing but how do I get it onto my website? 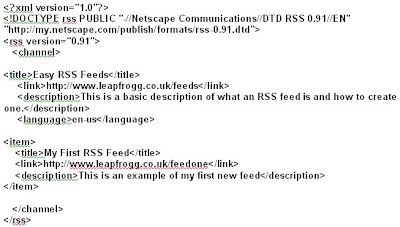 Create a file and call it something like Myfeed.xml or Myfeed.rss and make sure it has the .xml or .rss extension. Then Upload the Myfeed.xml file to your web directory on your web server. 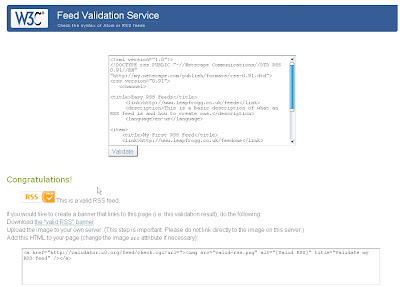 What is Feed Validation the Magazine’s talk about? and you will need to cut and paste your code into this window. I was lucky to get 1st marks, thanks to webdevtips. How do people know the Feed is on my page if they can’t see it? To let people know that the feed is there and to prompt them to subscribe to it, add a logo like either of these two , you just have to copy the button to your web directory in the same way as you added the .xml file. 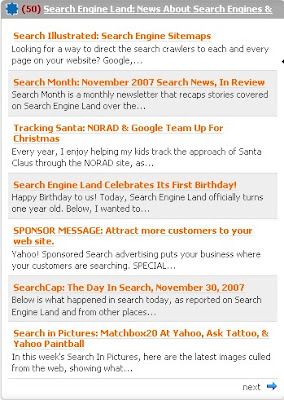 Then add the logos on the page and display your RSS to the web (e.g on your homepage). You must also add a link to the RSS or XML button that links to the saved .xml file. This then provides a visible link to your saved feed as shown above. You can obviously change the title to what ever you want it to say. OK, so now it’s on my web page, but it is meant to go beyond my website? Now you have got your feed URL and feed on your website, you can submit it to applications known as content aggregators. Some sources are provided below. (I will talk about aggregators in more details and about analysing feed data in my next post) – RSS Network, RSS Locator, Syndic8, Daypop, Feedster, Technorati, Userland and Rocket news. Do remember that you must use the Feed URL to submit to these directories and not your homepage URL. Do I have to do anything else in the future or do I leave it alone now? You will need to keep your feed fresh and make additions to your .xml or .rss file as regular as possible and making sure that each of these additions has a link of its own on the website, also always make sure that your feed is available. 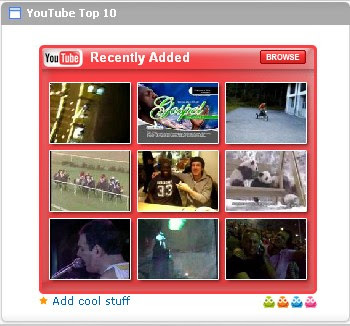 You need to try to keep your channel items to a maximum of five, deleting older items from your feed as you update it. The dates next to your news items will adjust depending on when content aggregators pick them up. Sources I used for this post were: http://www.w3schools.com/rss/rss_publishing.asp / http://searchenginewatch.com/showPage.html?page=2175271 and http://www.xul.fr/en-xml-rss.html . Thanks guys, it’s all a bit clearer now! ← Ad Scheduling on Yahoo – SORRY YOU CAN’T!